Another year has passed and it’s my Dad’s birthday again. Last year he was somewhere in Russia – actually he’s in Astana which I know isn’t Russia – and I was asking if anybody knew Happy Birthday in Russian. So, for next year I just need the sound file. How do you actually say that? For the first time in many, many year, the Pride festival took place in Hyde Park and I was there. 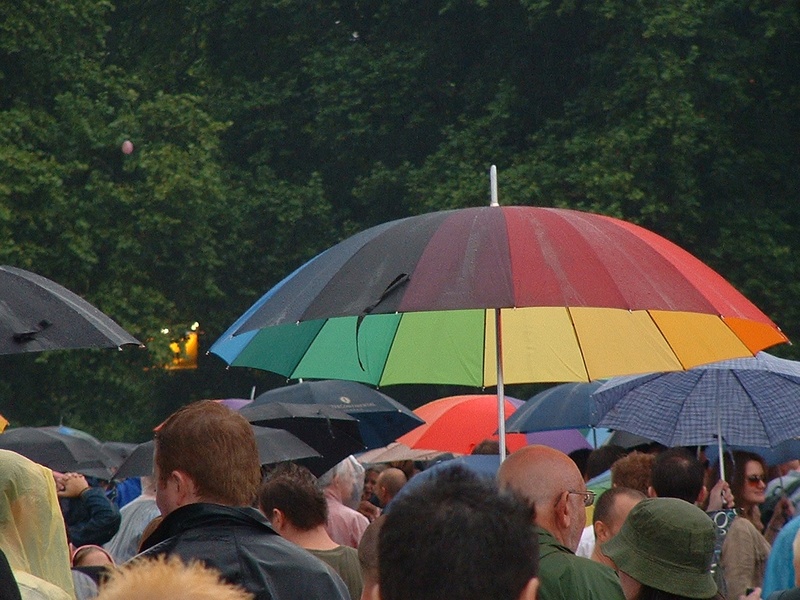 Well despite the weather and the somewhat officious woman searching my bag on entry, this year’s Pride in the Park in Hyde Park was fabulous – the best I have been to (probably ever – although my first Pride on Clapham Common was pretty cool too). After breakfast at a friend’s house, PY and I headed down to Embankment for the parade. This is the first time I’ve ever marched with the crowd and it was brilliant – the only downside of actually taking part is that you do not get to see it all. In a bid to overcome this, we ran ahead and watched part of the parade (including the fabulous OutEverywhere bus) and then joined in at some point (for a great deal of the time we marched near a float that Josh from a previous Big Brother was prancing about on). The atmosphere was superb and the crowds watching were huge. Coming up to Piccadilly Circus was just a mass of people – it was quite exciting really. Then we made the park. We made our way to the main stage and seeing Liberty X (who were surprisingly good), Ulta Nate (who sang a whole stack of songs that I was familiar with) and Blue (who were also very good). Later in the day we caught Tom Robinson and Jimmy Sommerville (this after standing on the sidelines singing along to Bananarama – but as nobody has a picture of that I will deny it at a later date). At some point in the afternoon – just after it started to rain – we had a wander around the market stalls (which seemed more varied than other times) and had a poke in some of the dance tents (although it’s not really my thing). By late afternoon, the rain was pouring but spirits were not dampened (and. luckily, for most of the afternoon the ground in Hyde Park held up). It was an exhausting day but it was worth it and it was great to be with a bunch of other homos just having a good time. There will be some pictures in the gallery, eventually. This is curnow.org, Jon Curnow’s personal website. I’ve decided to have a bit of a revamp and move some of the content around. Thus, most of the blog content is no longer here. Eventually, I will add some more content to curnow.org. There’s always an About Me page. This is one version of mine. I think it’s the original but some of my writings have been lost over the years. I know there is a more recent version but this is a mini biography which is quite nice, really. It’s probably about time that I introduced myself. I am Jon Curnow and this is the latest incarnation of my home page – which has been in existence in various guises since about 1993. I used to have a blog here but I’ve moved much of that content elsewhere and, when it’s all finished, I’ll post a link here. I was born on September 12th 1970 in a place just outside Wigan in Lancashire and I lived there until moving to Shrewsbury, Shropshire a little before my fourteenth birthday. I went to Meole Brace School and on to Shrewsbury VI Form college. In my spare time I answered the ‘phones, played with tape and made coffee for BBC Radio Shropshire. I studied in Scotland at Stirling University and, following graduation with a degree in Film and Media Studies, I moved south to London. I have lived in Earlsfield ever since. I have spent time working in satellite audio distribution for the radio industry, online publishing for offline magazines and for software companies who worked in the online space. Right now I work for an American software company who produce software for the online advertising industry.